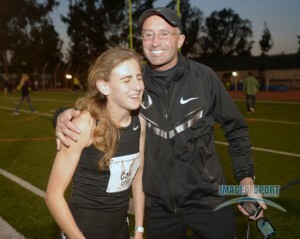 Coach Salazar all smiles after Mary Cain sets American high school 1500m record 4:04.62 at at the 2013 USATF Occidental High Performance Meet in May 2013. Boston, Ma. — Had a nice sit down with old friend and Nike Oregon Project coach Al Salazar today after hosting the New Balance Indoor Grand Prix press conference at the Lenox Hotel. Al , who grew up in suburban Wayland, Mass., has Galen Rupp racing the one-mile tomorrow, while Bronxville, N.Y. high school sensation Mary Cain will go in the 1000 meters. Both athletes have already had great success this indoor season with Galen taking down two American records — the 5000m (13:01.26) and the two-mile (8:07.41), both at Boston University in January – and Mary knocking down the world junior record in the 1000m January 17th (2:39.25), then barely missing the world junior mark in the mile January 24th at the B.U. Terrier Invitational by 1/100th of a second in 4:24.11. 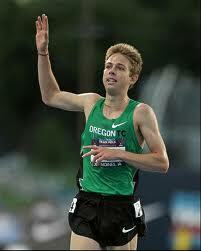 Galen had originally planned to take a shot at Hicham El Guerrouj’s indoor world mile record of 3:48.45 at B.U. tomorrow as the NBIGP was being run at the Reggie Lewis Center on the campus of Roxbury Community College, but after the two-mile record and 4 X one-mile workout that followed 45 minutes later (4:20, 4:20, 4:16, 4:01!) they thought better of it. Thus, Galen will work on his racing tactics instead against a field that includes two Olympic 1500m silver medalists, New Zealand’s Nick Willis (2008) and American Leo Manzano (2012), as all three sharpen for the March 7 -9th IAAF World Indoor Championships in Sopot, Poland. My first question for Al, was Galen on the cusp of being too sharp after his 5000 and two-mile records? 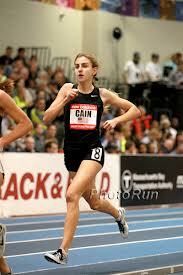 Two years ago Galen ran 3:34 indoors for 1500 meters, the equivalent of a 3:51 mile. Last year he dipped under 3:51 with a 3:50.92 indoor mile. One year later he’s running records at two miles and 5000 meters. Asked what 17 year-old Mary Cain’s chief attribute is, Al stayed in the same lane. Last year Al made a big deal about Mary’s ungainly running form, MARY CAIN – CHIN UP, SHOULDERS BACK, CAN’T LOSE,– and on the advice of his daughter Maria, who is a horse person, put Mary into a back brace horseback riders use to assist with their posture in the saddle. So how does he assess that work one year later? With five U.S. junior and seven high school records on her resume, I wondered if Mary was ahead of whatever schedule Al had considered when he first took her on in 2012. This scientific analysis of stride is something I learned about first-hand from Pegasus Sports Performance which took similar measuring technology into the field in Kenya in 2012. Working with then marathon world record holder Patrick Makau, we tested his stride efficiency on a 25 km fartlek session on the Masai Land Road outside Ngong, Kenya. There we discovered a marked asymmetry in Makau’s stride, and since then, he has come down injured and been off his game. Finally, I asked Al about his other star pupil Mo Farah, who is in Iten, Kenya prepping for April’s Virgin London Marathon, his debut at the long distance. The goals for all three of Alberto’s athletes now isn’t just to run fast, that they can do. Now is the time for winning to take precedence. Mo has that down pat on the track with his double golds at the World and Olympic Games. Can he now translate his winning ways to the marathon? Galen’s goal last year at the NBIGP was to win, and he got beat in the 3000 by Hagos Gebrhiwet, whose 7:32.87 was a world junior record. Hagos will defend that title tomorrow against another loaded field. In 2013 Mary smashed the U.S. high school two-mile mark by 17 seconds at the Reggie 200m oval, but she took third place behind Ethiopian superstar Tirunesh Dibaba and Canadian Olympian Sheila Reed. It’s a new year, with new goals — Mary said she still might take the Latin AP (Advanced Placement) test — “I don’t know if I’ll get a 5 or a 1” — but for coach Salazar the flame burns just as brightly as ever. Watch the meet tomorrow live on NBC Sports channel beginning at 4:30 p.m. Eastern time. Tune in to USATF.tv before and after (6:00 p.m.) the meet for earlier meet races and a post-meet Cool Down show. Alberto sounds just like Dellinger. Not a bad coaching role model. Great discussion on Athletic Training, Racing from The Best . !